Hooray for Fridays! While we are sad there isn't a Clemson football game tomorrow, we know our Tigers deserve a restful weekend. We took somewhat of a rest ourselves and didn't do too much posting this week, but we think today's post will definitely make up for it. Today we have a fabulous giveaway from one of our long-time, fabulous sponsors Marley Lilly - your one stop shop for all things monogrammed. Clutches, scarves, jewelry...if you haven't before, you NEED to visit this online shop. 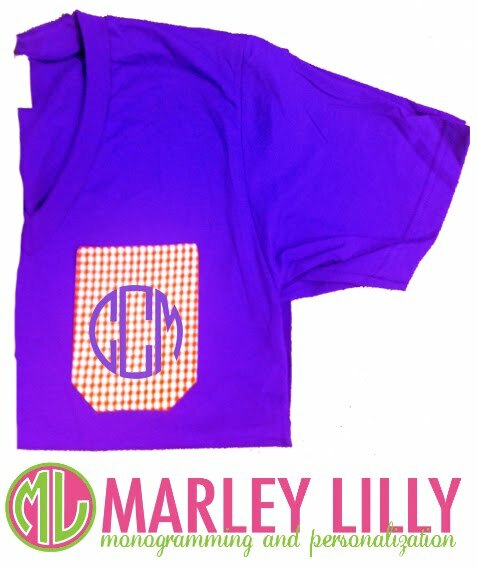 One very lucky Clemson Girl is going to win this super cute purple tee with a orange patterned pocket - complete with a monogram of the winner's choice! Deadline for all entries is Midnight tonight. We will draw a winner at random tomorrow and contact the winner by email. The winner will have 48 hours to reply to our email once it's sent or we will draw a new winner. Big, big thanks to Marley Lilly for sponsoring today's amazing giveaway!